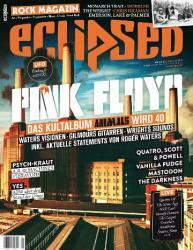 One for our German friends - the new issue (cover date December 2017-January 2018, issue number 196) of the distinctly Floydian titled eclipsed magazine is a Pink Floyd special, looking at the anniversary of a key, and much loved, album. As eclipsed note, "Released forty years ago, Animals is certainly not the most typical Pink Floyd album. It's much more than just a record. From a distance of four decades, Animals is the psychogram of a society that has been subjected to extreme political, economic and cultural upheavals. At the same time it is the early conclusion of the music of a decade between progressive rock and punk. In the magazine we explore the essence of the record, with which the band conquered a new terrain for itself, and investigate which forces acted on the album and which unleashed it." Elsewhere in the magazine, there are features on Yes, Vanilla Fudge, UFO (the band, not the club), Emerson, Lake & Palmer, and more. The magazine is available now in German stores, and online via eclipsed.de. Our thanks to Michael Nickel for the info about this publication.